The Free Mini Album... First I’d like to state that this mini album is not an actual CD release and never will be. 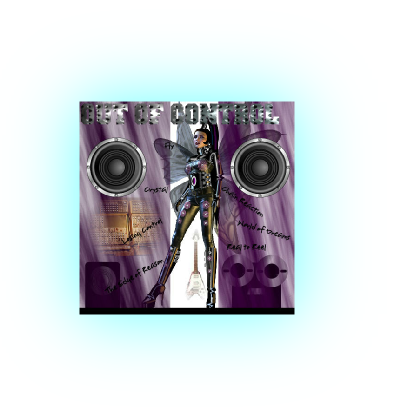 It’s a merely a collection of free MP3 downloads of various recordings of “Out of Control” which was a band I started with my friend Phil Clogg over 30 years ago. Some recordings are of a studio demo tape we did and some are rehearsal tapes. I’ve placed this mini album with all my CDs as this seemed the best place to put them. The usual CD cover image has been replaced by a poster I created. 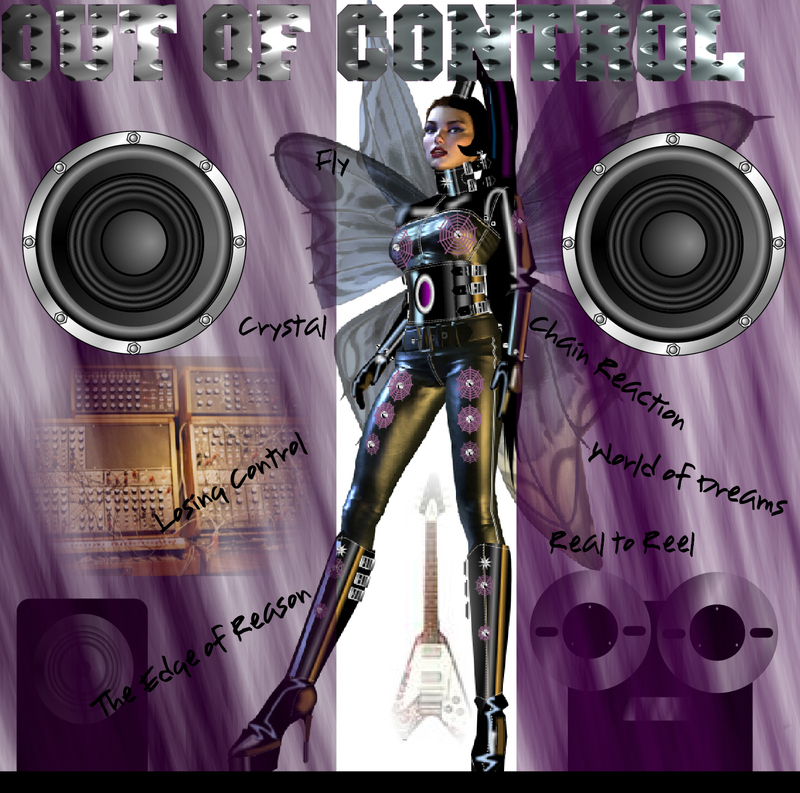 Out of Control was a unique electronic rock duo. As you can hear it was a mainly high energy aggressive outfit that made use of a punchy electronic backing machine coupled with a hard edged guitar sound. Through a loud PA it could be quite physical. Strangely our 100% hard rock image was founded on much geekyness on my part. Because what made it unique was the fact that we used one of the first computer micro-processor boards on the market to generate riffs and electronic percussion for the set. See link below to the “Out of Control” story. I saved up and bought the board as long ago as 1979. I wrote machine code software to replay manually entered rhythmic control sequences for a synthesiser and electronic percussion unit themselves sequenced from a pre-determined playlist. It provided the basic control data for our complete set. The synthesiser, percussion unit and machine code programming were all my creations. Phil was the song writer and guitarist and we arranged stuff together. He also managed somehow to play a bass synthesiser with a pedal board and help me build a small PA system to gig with. This band was a turning point for me and formed the starting point for everything I’ve done since with electronic music. I owe Phil a great deal for the experience and for his willingness to go into the unknown! The above downloads are both a way for me to present an idea of what we did and what all this sounded like. It’s Also to thank Phil for his great contribution to the band and a little part of history. The poster... As this is not a CD release with no cover artwork initially, the web page space looked a bit bare so instead I put together this computer generated fantasy image poster on the theme of control, our gear, music, and my own impressions of a few of Phil’s lyrics. There’s a high-res version on the link. I got the idea from a nice paint job on the local rock pub’s van, keeping the heavy rock imagery of speakers, guitars etc. but cheekily I substituted the usual winged skulls with a winged bad fairy instead, I suppose posing the question is she ‘out of control’ or ‘in control’? The Tapes..... First I’d like to thank Phil for agreeing to let me put these tracks on my site for free MP3 download. I’m pleased he has agreed as several are not perfect polished recordings. This is why I’ve listed them in two parts. The first part is a three track demo tape we did in a local 8 track studio so is a finished but demo project. The second part is a collection of simple rehearsal tapes. Phil and I used a 4 track tape recorder as a writing aid. Once we had a song in reasonable shape we would record it in the rehearsal room to review it and see what it sounded like. Part 2 contains some of these recordings. They are not by no means perfect, highly engineered and polished projects; they are merely just straight, one take, recordings of songs in progress when we first got an arrangement, more or less, there and we wanted a record of it. What is on these tapes is exactly what would have gone out to the PA system, only hopefully a bit more rehearsed and sounding more like the demo section. After 30 odd years the tapes are not in great condition. Some were OK but one or two were starting to shed oxide and gunge up the tape heads. So I’ve had to transfer the odd track in sections to the computer and edit them together. Apart from that they are pretty much intact with only the most basic renovation work done to them. Most of these tracks are Phil’s songs. Only “the Edge of Reason” is an instrumental written by me and arranged jointly with a guitar solo by Phil. The tune and chords for “Into your World of Dreams” was written by me and performed with an earlier band Phil and I were in “City Hearts”. He wrote fresh words to it and we did a new arrangement of it. I hope you enjoy this little corner of musical history. The full Out of Control Story is here.